Having recently moved house with myself and the other half, a certain little giraffe was slightly bemused to find not just one but two new inhabitants of his kitchen: the sister, which he's quite happy with, and something else ginger, which he's not quite so happy with. Yes, we are now owned by a big ginger tom cat called Charlie. George has been sulking for about two months now, which is why we haven't been able to post much on here. Note: the first stage in this is to marinate, so you need to do this the night before or the morning on the day you're going to cook. Firstly, break down the duck. It's pretty much like a chicken but the legs are a slightly different shape - you'll find the start of the leg a lot lower down the body of the duck. It's fairly easy to find - slip a knife through and twist to remove. Also remove the wings, then fillet the breasts off the crown. Next make the dry marinade. Lightly toast 2 tablespoons each of cumin seeds and coriander seeds before pounding in a pestle and mortar with a big glug of olive oil, and a tablespoon each of white wine vinegar, black peppercorns, chili flakes and smoke paprika. Rub the mixture all over the duck pieces. Add a few sprigs of rosemary and put in the fridge overnight or for at least 6 hours. For the confit, take the legs and wings out of the mixture and brush off any remaining marinade. In a dish, cover them with duck or goose fat (you'll need about two jars of goose fat in a small casserole dish) and put into the oven at 150 degrees for at least three hours. When you take them out of the fat the meat should be very tender and falling off the bone. Leave in a sieve or on a wire rack so that the fat drains off for 20 minutes or so. Pour the fat into a jar (or jars) and save. Remove the meat from the bones, and leave aside for using later. Make a stock with the giblets and crown (that you've taken the breast fillets off). Put four onion quarters, some carrot, celery and rosemary into a pan with the giblets and crown, pour over water, and simmer for at least an hour. When done, sieve the stock out. For the confit pies, mix the confit duck meat with some cannelini or white kidney beans, pour over the stock, and top with a couple of thinly slides potatoes before baking for 40 minutes at around 200 degrees. For the gravy, make a roux before slowly stirring in the stock and leaving to simmer and thicken up for 15 mins. For the smoked breast, lay a double layer of foil in a wok and pour over equal measures (about a handful) of black tea leaves, brown sugar and rice. Heat on high until the mixture is smoking. Put the duck either on a wire rack on top or in a bamboo steamer and cover again with foil. Smoke for 10-15 minutes depending on how smoky you want the flavour. Finish off by crisping up the skin in a pan before roasting in the oven for 5 minutes. 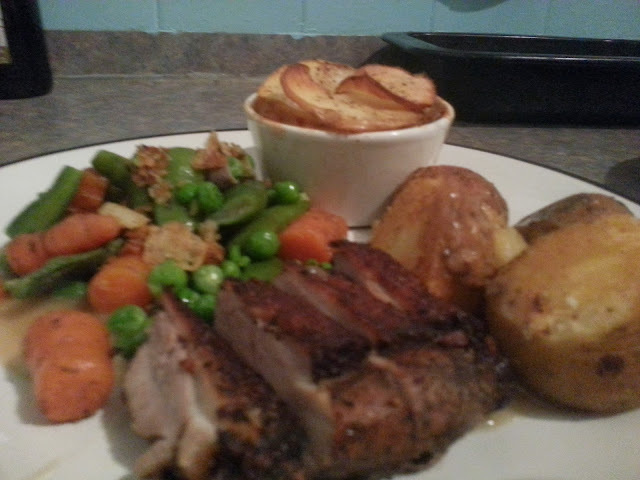 I served mine with roast potatoes (using some of the fat from the duck confit - save the rest for future roasties!) and steamed beans, peas and carrots. I reckon that's three ways... and luckily, the sister loved it. I don't think I've ever seen a recipe before that says, firstly, break down the duck.